"When I make this special-occasion veggie dish, I am ALWAYS asked for the recipe. Fresh steamed green beans provide a contrast to decadent melted Swiss cheese and crunchy topping. A family holiday favorite throughout my extended family. You can prepare ahead of time, leaving 4 to 5 minutes to steam the green beans and add other ingredients. Put into oven right before serving dinner (we usually put it in while carving the turkey)." Place a steamer insert into a saucepan and fill with water to just below the bottom of the steamer. Bring water to a boil. Add green beans, cover, and steam until slightly tender, about 5 minutes. Stir 2 tablespoons butter, flour, onion, sugar, and salt together in a saucepan over medium heat; gradually stir in sour cream. Cook and stir mixture until hot, thickened, and smooth, about 10 minutes. Add steamed green beans to the cream mixture. 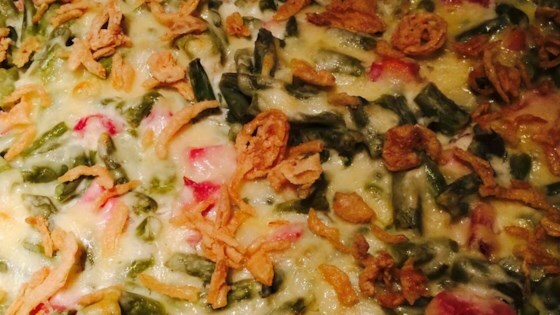 Pour green bean-cream mixture into a 2-quart casserole dish; sprinkle with Swiss cheese. Mix corn flakes and 2 tablespoons butter in a bowl until well coated; sprinkle over Swiss cheese layer. Bake in the preheated oven until cheese is bubbling and topping is browned, about 20 minutes. I'll definitely make this again and again. I used crispy onions instead of corn flakes. They wasn't any left for leftovers. We thought it was really good! I've been making this since I was in High School, (I'll soon be 70!) but the sour cream was a new addition. I love how the beans stay "meaty". This is my families favorite. My father found this recipe in the road when he was alive and it’s been a family favorite ever since!